PharmaSat and its flight system is an experiment designed to measure the influence of microgravity upon yeast resistance to an antifungal agent. The device is about the size of a loaf of bread; it is a secondary payload on a USAF Minotaur 1 rocket. PharmaSat is completely autonomous, despite its small size - a self-contained orbiting 'lab'. Telemeter the resulting population and viability data to Earth, along with system status data. The main technology subsystems include a 3-color optical absorbance system, microfluidic networks, multiple reagent delivery system, and miniature environmental control and power management systems. "PharmaSat is an important experiment that will yield new information about the susceptibility of microbes to antibiotics in the space environment," said David Niesel, PharmaSat's co-investigator at the University of Texas in Galveston. 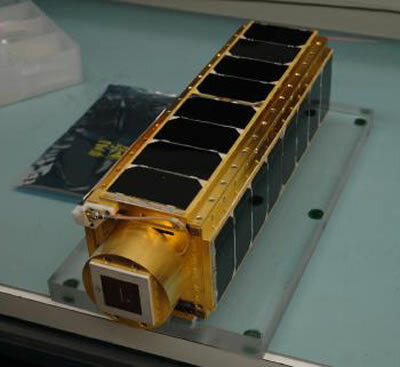 "Secondary payload nanosatellites expand the number of opportunities available to conduct research in microgravity by providing an alternative to the International Space Station or space shuttle conducted investigations," said Elwood Agasid, PharmaSat project manager at NASA's Ames Research Center in Moffett Field, Calif. The PharmaSat project may remind sf readers of Project Scoop, from Michael Crichton's 1969 novel The Andromeda Strain. In fact, the true aims were quite different. The true aims of Scoop were to find new life forms that might benefit the Fort Detrick program. In essence, it was a study to discover new biological weapons of war.